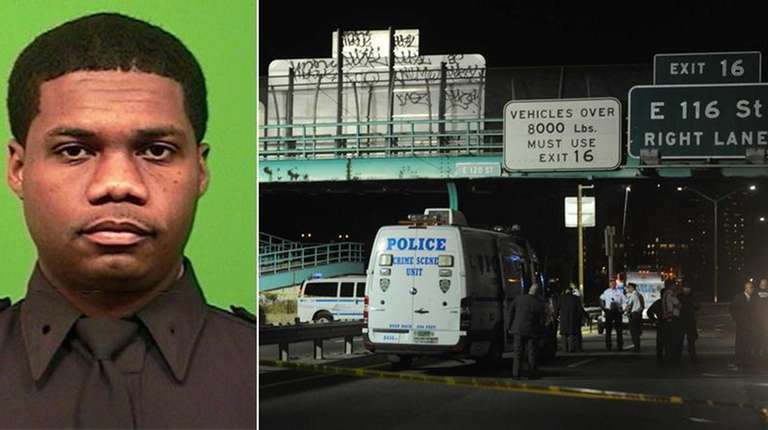 NYPD investigators Sunday morning recovered from the Harlem River a gun they believe was used to fatally shoot Officer Randolph Holder, officials said. The .40 caliber semiautomatic Glock pistol was found deep in the water about 3 a.m. near 123rd Street -- not far from where a magazine loaded with 13 rounds was discovered hours after the shooting -- after days of extensive searching, said William Aubry, Manhattan chief of detectives. "That firearm is consistent with the firearm we were looking for regarding the homicide of Police Officer Holder," Aubry said at a briefing Sunday at the search site. "This fits all the characteristics." Police think suspect Tyrone Howard, 30, tossed the gun into the river after fatally shooting Holder Tuesday night. Howard was charged with first-degree murder. Harbor Unit scuba diver Det. John Mortimer found the gun about 20 feet below the water's surface, Aubry said. To make a definitive match, the gun will be processed for fingerprints and DNA, and will be test-fired for comparison with discharged shell casings found at 120th Street near Holder's body and discharged casings found at 102nd Street, near the original report of shots fired, Aubry said. Police plan to let the weapon dry naturally, so as not to disturb possible DNA and fingerprint evidence, a high-ranking law enforcement source said. Police also will seek to link the gun to a loose round of the same caliber that officers found in Howard's backpack after they arrested him the night of the shooting, the official said, adding that the round will be examined for markings consistent with the gun or magazine. Investigators Sunday also expanded the search area for the bullet that struck Holder from 100 to 200 feet after forensic experts determined the bullet could have traveled farther, Aubry said. A "methodical" line search was also conducted by 100 officers along the northbound and southbound lanes of the FDR Drive, Aubry said. The bullet has not been found. "It's been a 24/7 operation," said Aubry, who explained officers were "very motivated" to find evidence in the killing of a colleague. "Numerous units within the NYPD have been extensively exhausting all efforts to recover all forensics." Aubry praised investigators for their diligent work: "Some of them worked all night long and they volunteered to come here. Det. John Mortimer -- these guys in scuba -- I can't say enough about the work that they do. They were down there. It was down in 20 feet of water and he recovered it. "The conditions down there -- it's dark, they can maybe only see 12 to 24 inches out in front of them and they're out on their bellies looking for this, and he ended up finding it. And it's a good find," he said. Holder, 33, of Brooklyn, joined the NYPD in 2010, and was assigned to the housing bureau unit. A funeral service is scheduled for Wednesday afternoon at Greater Allen A.M.E. Cathedral of New York in Jamaica, Queens.